A collection of activities for use with the text "The Cask of Amontillado" by Edgar Allan Poe. 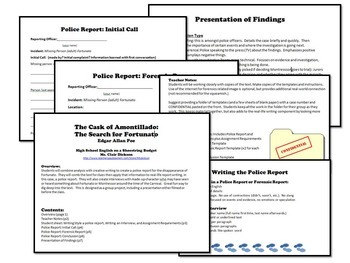 A variety of tasks from reading questions to point of view writing to a real-world-writing investigation of Fortunato's disappearance. 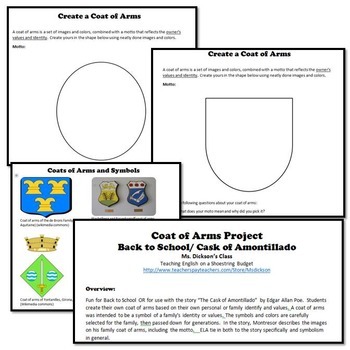 •The Cask of Amontillado Coat of Arms Project: great as an anticipatory set, students create their own Coat of Arms with symbols that represent them. Also works as a stand-alone Back to School or start of the semester activity with ELA tie in of symbols. Includes 4 versions, each with a different shape for the Coat of Arms. 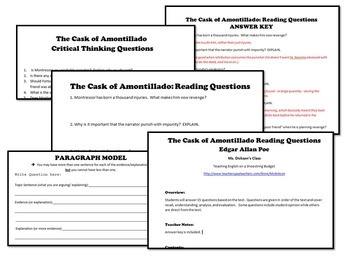 •The Cask of Amontillado Reading Questions, includes student printable and answer key along with a set of critical thinking questions. Optional paragraph model included. 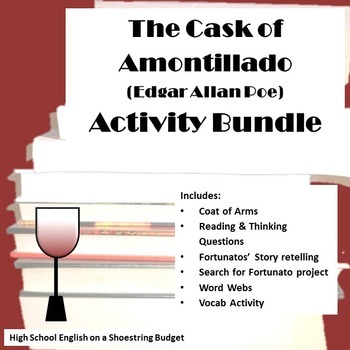 •The Cask of Amontillado The Search for Fortunato Project a project that turns students into sleuths as they investigate the missing Fortunato. Includes presenting their findings to the class in a real-world creative scenario. • The Cask of Amontillado Word Webs plus Venn 3 pre-made word webs, a blank word web, and a venn diagram. This bundle is a ZIP file which includes a single file Word (.docx) document with all activities, plus PowerPoint (.pptx and .ppt) files for the Teacher Concepts and Task Cards (for the vocab activity). The Cask of Amontillado Activities Bundle is also available as a single file PDF. Cheaper, but not editable. Also part of the Halloween ELA Activity Bundle. Big bundle and big savings!